Choice of Techniques: An Aspect of the Theory of Planned Economic Development, (Blackwell, 1960). On Economic Inequality, (Clarendon Press, 1973). Collective Choice and Social Welfare, (Elsevier Science, 1979). Poverty and Famines: An Essay on Entitlement and Deprivation, (Clarendon Press, 1982). Choice, Welfare, and Measurement, (MIT Press, 1982). Resources, Values and Development, (Blackwell, 1984). Commodities and Capabilities, (Elsevier Science, 1985). On Ethics and Economics, (Blackwell, 1987). Inequality Reexamined, (Clarendon Press, 1992). Development as Freedom, (Alfred A. Knopf, 1999). Employment, Technology and Development, (Oxford University Press, 1999). Beyond the Crisis: Development Strategies in Asia, (Institute of Southeast Asian Studies, 1999). Reason before Identity, (Oxford University Press, 1999). Rationality and Freedom, (Harvard University Press, 2002). The Argumentative Indian: Writings on Indian History, Culture and Identity, (Allen Lane, 2005). Identity and Violence: the Illusion of Destiny, (W. W. Norton, 2006). The Idea of Justice, (Belknap Press of Harvard University Press, 2009). Peace and Democratic Society, (Open Book Publishers, 2011). Hunger and Public Action, with Jean Drèze, (Clarendon Press, 1989). India: Economic Development and Social Opportunity, with Jean Drèze, (Oxford University Press, 1995). Mismeasuring our lives: why GDP doesn't add up: the report, with Joseph E. Stiglitz and Jean-Paul Fitoussi, (New Pr，2010). An Uncertain Glory: India and its Contradictions , with Jean Drèze, (Princeton University Press, 2013). Utilitarianism and Beyond, co-edited with Bernard Williams, (Cambridge University Press, 1982). Endemic Hunger, co-edited with Jean Drèze, (Clarendon Press, 1991). The Quality of Life, co-edited with Martha Nussbaum, (Clarendon Press, 1993). Social Choice Re-examined, co-edited with Kenneth J. Arrow and Kotaro Suzumura, (St. Martin's Press, 1995). The Political Economy of Hunger: Selected Essays, co-edited with Jean Drèze and Athar Hussain, (Clarendon Press, 1995). Indian Development: Selected Regional Perspectives, co-edited with Jean Drèze, (Oxford University Press, 1997). Handbook of Social Choice and Welfare, co-edited with Kenneth J. Arrow and Kotaro Suzumura, (Elsevier Science, 2002). Public Health, Ethics, and Equity, co-edited with Sudhir Anand and Fabienne Peter, (Oxford University Press, 2006). Markets, Money and Capital: Hicksian Economics for the Twenty First Century, co-edited with Roberto Scazzieri and Stefano Zamagni, (Cambridge University Press, 2008). Sen, Amartya (1962). “An aspect of Indian agriculture”. Economic and Political Weekly (formerly The Economic Weekly) (Sameeksha Trust) 14: 243–246. Pdf version. Sen, Amartya (Jan–Feb 1970). “The impossibility of a paretian liberal”. Journal of Political Economy (University of Chicago Press via JSTOR) 78 (1): 152–157. doi:10.2307/1829633. http://www.jstor.org/discover/10.2307/1829633?uid=3738032&uid=2129&uid=2134&uid=2&uid=70&uid=4&sid=21103853250761. Pdf version. Sen, Amartya (March 1976). “Poverty: An ordinal approach to measurement”. Econometrica (The Econometric Society via JSTOR) 44 (2): 219–231. doi:10.2307/1912718. https://doi.org/10.2307/1912718. Pdf version. Sen, Amartya (September 1979). “Utilitarianism and welfarism”. The Journal of Philosophy (Journal of Philosophy, Inc. via JSTOR) 76 (9): 463–489. doi:10.2307/2025934. https://doi.org/10.2307/2025934. Sen, Amartya (1986). “Chapter 22 Social choice theory”. Handbook of Mathematical Economics (Elsevier ScienceDirect) 3: 1073–1181. doi:10.1016/S1573-4382(86)03004-7. https://doi.org/10.1016/S1573-4382(86)03004-7. Sen, Amartya (20 December 1990). “More than 100 million women are missing”. The New York Review of Books (NY Rev Inc.). http://www.nybooks.com/articles/archives/1990/dec/20/more-than-100-million-women-are-missing/. 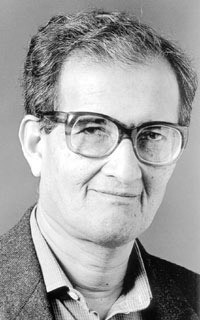 Sen, Amartya (7 March 1992). “Missing women: social inequality outweighs women's survival advantage in Asia and North Africa”. British Medical Journal (BMJ) 304 (6827): 587. doi:10.1136/bmj.304.6827.587. https://doi.org/10.1136/bmj.304.6827.587. Pdf version. Sen, Amartya (May 2005). “The three R's of reform”. Economic and Political Weekly (Sameeksha Trust) 40 (19): 1971–1974. http://www.epw.in/special-articles/three-rs-reform.html.